Now, in Russell Wilson’s third season as he prepares to lead the Seahawks back to his second Super Bowl, people are talking about his faith. 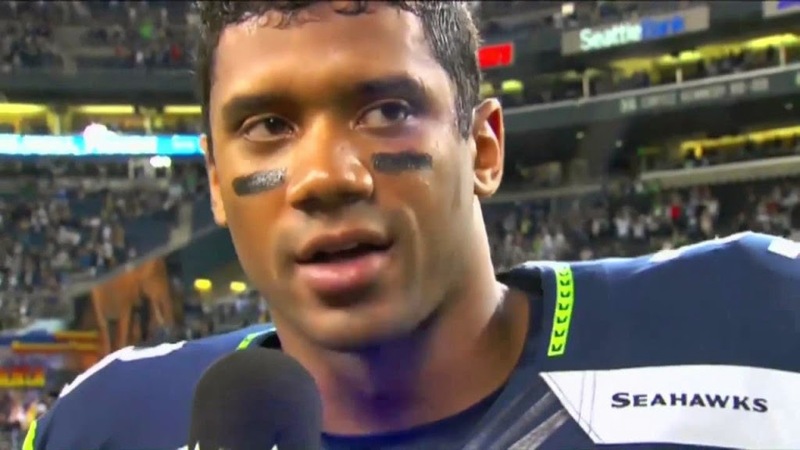 After the ‘Hawks beat the Packers in the NFC title game Wilson spoke through tears about how God had prepared him and the team for moments just like that. A few days later the quarterback he defeated, Aaron Rodgers, said he doesn’t think God cares about the outcome of football games. Is Wilson right? Did God prepare him for that moment? Is Rodgers right? Does God not root for any of the football teams out there? If I believed that God cared about the outcome of football games, I would first have to believe that God willed the Seahawks to be terrible for decades. I would have to believe that God influenced the refs to call touchdowns that weren’t in Super Bowl XL just so the Stealers would win (yes, I’m still bitter about that game). If I believe that God made the Seahawks win against the Packers in overtime, then I also have to believe that God made the Seahawks lose against the Packers in overtime in 2003. But neither do I think that God is a football agnostic. 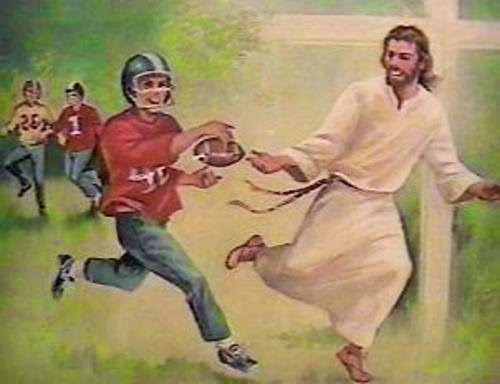 I don’t agree with Rodgers that God doesn’t care about football (or other sports). God cares about us. He wants each of us to use our unique skills, talents, experience, and opportunities to show love to our neighbors and to bring glory to God. If our job is as a plumber or a programmer or a preacher or a punter, God wants every one of us to use our job to love others and to love him. That’s the core of the Law and the Prophets (according to Jesus). I think God cares about football in the same way he cares about every job that everyone has. He cares that we use what we’ve been given – whether little or much – to obey him and love our neighbors. As a writer and a preacher, my job is to string words together into sentences and paragraphs that convey meaning. I could use that talent to make money writing self-help books and giving motivational speeches, but instead I take a moment to pray before I pile words together. I ask that God would give me the words to speak or write for his glory. If I believe that God will give me stories and sermons so I can do my job to his glory, then I have to believe that he will give football players similar opportunities to use their jobs to bring glory to him. I don’t think that God wants the Seahawks to win the Super Bowl more than any other team. But I do think that God can use football players for his glory, whether they win or lose. I do think that these men who have an amplified voice in the world can, through the platform of sports, make an amplified difference. Russell Wilson can help to fight childhood diseases and to encourage young people facing life-threatening illnesses. Richard Sherman can force us to have conversations about race and racial bias. Marshawn Lynch can make us all reflect on how much time we spend talking about doing our jobs rather than just being about that action (boss). And that’s just a small list of a few players on one team. I think God does care about football, but not who wins or who loses. God cares about us being whole people who use our bodies, minds, hearts, and souls to love him and to love our neighbors. If that happens through athletes playing a game, may God be glorified. If that happens through a writer penning some words, may God be glorified. If that happens through a plumber working hard for a fair price, may God be glorified. James T Wood is a writer, minister, and teacher in Portland, Oregon. He and his wife Andrea have worked with established churches and church plants all over the US. You can find out more about James and what he's up to at www.jamestwood.com. Let me add that I'm not against motivational speakers and self-help books in general. Some of those are intended to make money for the author/speaker, but some are good tools for people. I was referring to the bad ones, not the good ones.